I despise the terms “decorative arts” and “minor arts” to categorize any art work that is not a painting, print, photograph, or sculpture. I prefer the word “miscellaneous arts,” because small, often utilitarian works of art are just that—ART. Counted among these (by me) are all of the precious little luxuries that we often overlook for their fine aesthetics, probably because they are…usable. Let’s take joy in little art works this week. 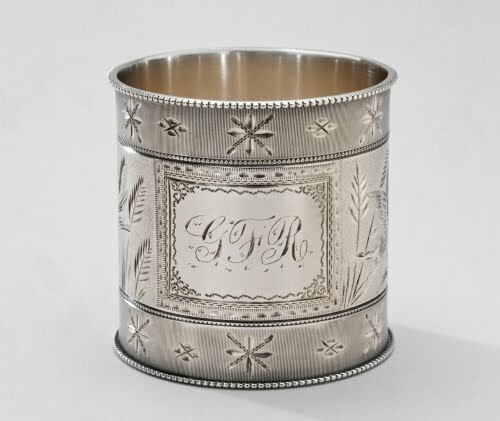 When I was born, my Swiss relatives gave me a silver napkin ring with my name on it (well, it says “Karli” actually). Whenever we go for a visit over there, there’s a napkin ring for my use. I don’t know many places where napkin rings are used anymore, but it sure makes a person feel refined! This lovely example is from an American firm that showed good old American business ingenuity, buying out several competitors and getting the rights to use their dies for all types of gorgeous silver and metalware. Shiebler and Company made quality sterling silver tableware, novelty items, souvenir spoons, and jewelry. They were most famous for their Classical Revival items in the “Homeric” and “Etruscan” design. Lucky “G.F.R.” to have such a nice napkin ring. Speaking of refined, here’s a case for calling cards. Calling cards were like the business cards of the 18th and 19th centuries. If a person went to visit someone who wasn’t home, they would leave their card (on a silver tray held by a butler, no doubt). This is not so different from the way people swap business cards nowadays, but wouldn’t it be nice to carry business cards in such a spiffy little case? This case was made by another New York firm (there were a lot of them at the time!) that specialized in jewelry, boxes, and novelties. It has a little bit of an Art Nouveau feel to the floral decoration. I’m just sorry we can’t see the sapphire knob. I vaguely remember as a child toothpicks being more readily available on restaurant tables. I’m not quite sure when that practice ended, but toothpicks would sure get noticed in this swell little piece. This would also be a good match holder, but that’s another whole category of “little art”—the “match safe,” which closed completely. Gillinder and Sons was started by a British immigrant who came to the US in 1853 and worked for a time at New England Glass Company before establishing his own firm in Philadelphia in 1861. 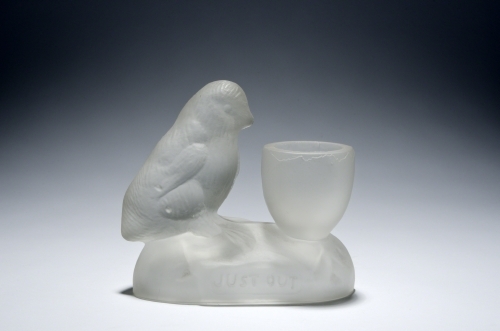 Frosted glass such as this was the most prized form of Gillinder, achieved with the use of etching acids. Gillinder was famous for its detailed animal decorations. Very few people write letters any more. It’s all texting, Messenger, and emails. But there was a time when a box of stationery was a special gift, especially if it came in a box like this! Letter writing in Japan was practically an art form in itself, almost like poetry. Needless to say this is no cardboard stationery box from the local CVS that gets thrown away when it runs out of paper! The Tokugawa shoguns (military dictators) ruled Japan from 1615 to 1868. During that time, they isolated Japan from any foreign influences via trade, thus ensuring a flourishing of indigenous arts. One of the traditional arts that continued to flourish during this period was lacquer work. Lacquer has played an important part in Japanese culture for more than two thousand years as a protective, decorative finish for items made from leather, wood, paper, bamboo, and metal. Japanese lacquer is harvested from the sap of the lacquer tree (Rhus verniciflua). It is applied to an object with a brush or spatula. Lacquer hardens to a waterproof finish in a controlled environment of high humidity and temperature. 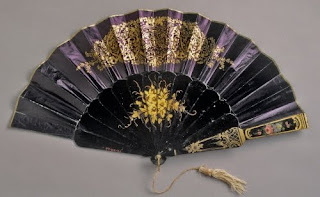 I know that the days before air conditioning when most women carried a fan are long gone, but many people – of both genders – nowadays still use fans. Let’s face it, nothing speaks elegance and refinement like the gentle flicking of the wrist with a fancy fan! In the 1930s and 1940s, non-air conditioned movie theaters used to give paper fans to customers— male and female—that bore company advertising. When it’s hot in church during the summer, people fan themselves with the program—what a perfect opportunity for a beautiful real fan! 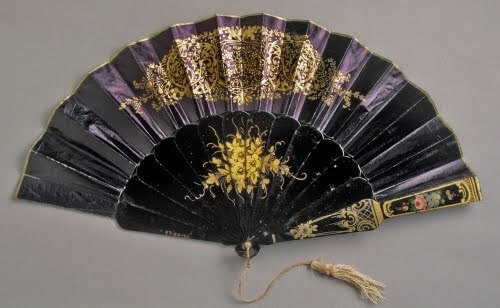 When fans were a virtual necessity as part of a woman’s ensemble, they were often beautifully painted in the latest style of either painting or miscellaneous arts. This fan displays the Rococo Revival taste that was all the rage during the mid-1800s. The inro developed during the late 1500s as a way for men to carry herbal remedies, seals, and coins. They were suspended from the obi (wide waist band) of traditional dress. 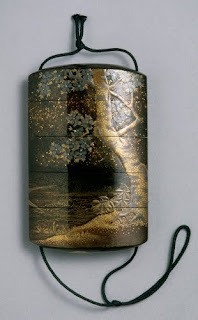 A decorative ojime, usually of carved wood or ivory held the drawers together at the top knot of the cord, and a carved netsuke (a larger bead-like element) kept the inro from slipping out of the obi. During the Tokugawa (Edo) period, not only did the dictators isolate Japan from trading with foreign countries, they also issued sumptuary laws restricting what classes could wear luxury clothing and accessories. One way prosperous merchants and middle class men could demonstrate their glamour and good taste was with a beautifully decorated inro hanging from their obi. 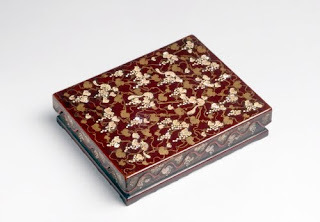 This beautiful example is proof that inro decoration reached its zenith of refinement during the Tokugawa shogunate. I’m not so sure that hand mirrors are used so much anymore either. As a slob, I only use the bathroom mirror to make sure I’m not a complete mess before going out. 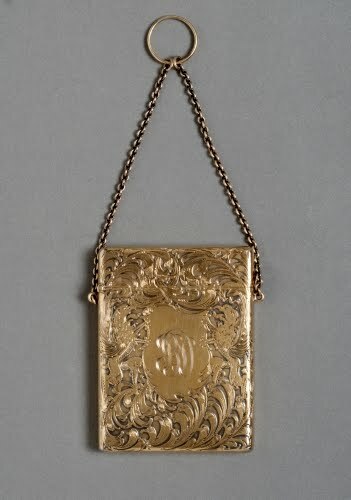 When women had time (and servants to help them) to get ready for going out, hand mirrors helped with the finishing touches to the face and hair. Hand mirrors were especially handy for travelling, though I’d be afraid of seven years’ bad luck when it inevitably would break it. 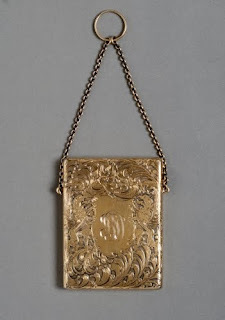 Mirrors such as this would come as part of a complete set including brush and comb. The hand mirror has a history as far back as Ancient Egypt, where they took the form of highly polished bronze or brass that had been beaten as thin as cardboard. 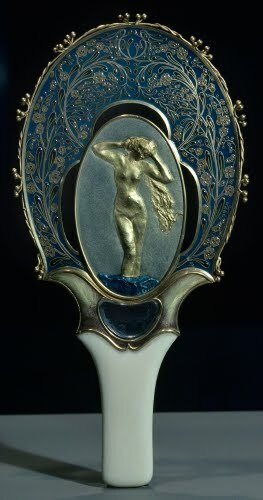 Bracquemond is probably most noted for his elegant Art Nouveau designs for all types of the miscellaneous arts, particularly ceramics. The interesting part of this mirror is the Venus figure provided by Rodin, who by 1900 was already a well-established sculptor. The term “vanity case” used to apply to clunky, box-like luggage meant to hold beauty supplies for women when they traveled. Of course, now that no one wants to wait for the luggage carousel at the airport, that size of bag is usually stuffed into the overhead, holding everything, including clothes. I’m not sure what this size vanity case would hold, except maybe cigarettes, although it’s sort of big for that. Probably a small square of makeup and a mirror. 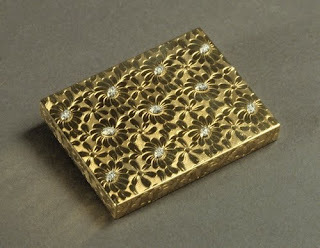 Van Cleef and Arpels was founded by the married couple Estelle Arpels and Alfred Van Cleef. Since its founding, the company specialized in luxury jewelry for the richest of the rich. They are perhaps best known for their Art Deco and Art Moderne designs during the 1920s and 1930s. Most of their jewelry is covered in diamonds, emeralds, sapphires, and rubies. I certainly wouldn’t flash something like this around at an airport these days! Before the advent of pocket-sized atomizers of scents, a person of good taste and glamour would carry a vial like this and dab a bit behind each ear and on the wrists. Once again, something encrusted with rubies and gold is not something I’d flash around in public anymore. What I find so beautiful about this little piece is that it is carved out of agate. The Técla firm, like Van Cleef and Arpels, specializes in luxury (in other words, expensive) jewelry. They were particularly popular during the 1920s and 1930s, featured in many glamourous magazine ads. At one time they had stores in New York, London, Berlin, Nice, and Biarritz, with the flagship store in Paris. 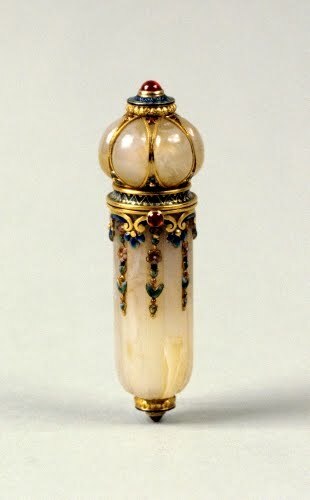 World War II (1939–1945) caused them to shut down all stores except Paris, but they continue to this day as a source for high-end jewelry and novelty items like this perfume vial. Trunks have been used as the principle method of transporting personal goods since the ancient world. Between the Middle Ages and the early 1800s, many people used trunks as furniture instead of beds or chairs. And one always sees trunks lashed to the top of the stagecoach that comes into Dodge on Gunsmoke. Trunks were a valuable luggage item for trans-oceanic travel when only ocean liners were available. They’ve gone the way of the dinosaur for the most part now, with impatient modern humanity able to fly everywhere with soft-sided, easy-to-stuff-in-the-overhead bags for personal goods. When the Spanish conquered and colonized central and south America (Peru in 1532), they sought to duplicate their culture in every way, right down to precious miscellaneous art objects for everyday use. 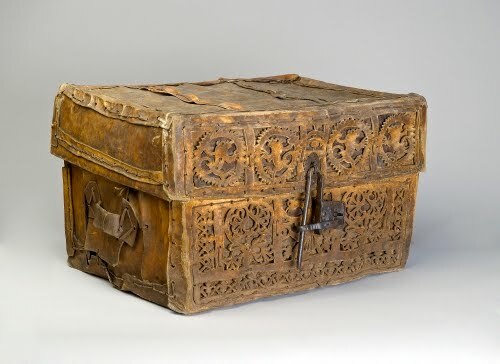 Petacas like this were based on one of the earliest traditional European forms of traveling trunk. The strong rawhide of this example is 1/2 inch (1.3 cm) thick! In Spain, these trunks would have been lined with remnants of Islamic silks, while in Peru they were lined with indigenous woolen textiles. Beauties like this were status symbols for wealthy colonists. My brother still uses the Art Nouveau silver tea strainer from my family when he makes loose tea. I guess the new-fangled tea balls that most people use for loose tea do away with the need for strainers during pouring. I just think it looks really elegant in any period costume drama on PBS when someone pouring tea uses a strainer. Aside from their Neoclassical decorative motifs, Shiebler was really well known for all sorts of floral forms in their silver utensils. 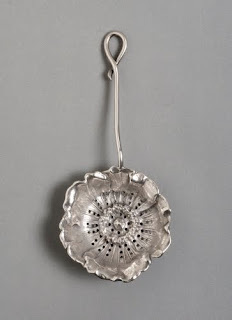 This silver tea strainer is particularly delicate in its form and—honestly—the height of refinement!